Everyday fill light 5 hours,the let the lamp rest a few minutes,a day can fill light 1-3 times. Do not look directly into the light, or shine into anybody's eye. Do not allow children to touch the lamp head,to avoid burns.  Improve Plant Health and Growth: Plant grow light gives off targeted wavelengths (460nm and 660nm) lights to help accelerate the growth of indoor plants, foliage plants, flowering plants, succulent plants, potted plants, rapidly promoting leaves and flowers blooming. 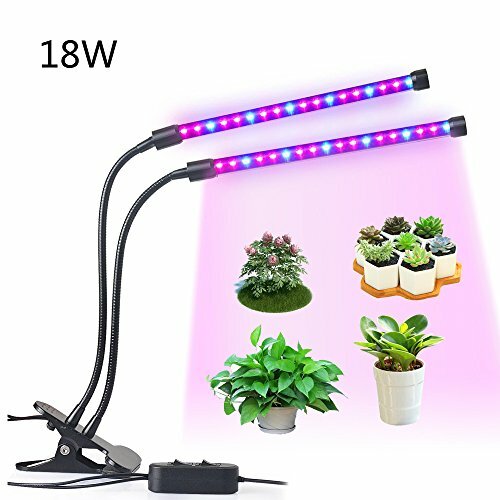  18W 36 LED Plant Growing Beads (24 red & 12 blue) .This upgrade version is ultra bright, lower heat and lower power consumption, high luminous efficiency and long service life. You can adjust the brightness of the light according to plant needs.  This grow light with 360 degree flexible neck and clamp is easy to adjust and place anywhere. The Wide linear light design let it can cover a larger area and provide energy for more plants.  Apply to indoor plants seedlings hydroponics greenhouse garden home and office. Accelerate the growth of potted plants, foliage plants, flowering plants and succulent plants.  18 months warranty with friendly customer service, we are always standby to reply emails and solve problems within 24 hours, please feel free to contact us for any reason for better solution. If you have any questions about this product by LEDMEI, contact us by completing and submitting the form below. If you are looking for a specif part number, please include it with your message.